Anyone who knows of John Gibb and of the Dunedin poetry fraternity, with which he has caroused over the last thirty or forty years, will be pleasantly surprised that this book, promised for all those decades, has finally made it into print. Gibb was one of many of us around in the 1970s onwards who spent nights, months and eventually years in the Captain Cook Hotel and the Robbie Burns Hotel, as well as at parties all over the city, discussing and drinking our way through philosophy, politics, art and, above all, poetry – sometimes even remembering what we had said the next day, when the same discussion picked up where it had left off! In many ways Gibb’s poetry reflects the male-orientated, traditional poetic that follows Allen Curnow’s dictum of not displaying too much of yourself in the poems you write. In his introduction to his anthology The Penguin Book of New Zealand Verse, Curnow confirms his own predilection for Eliot’s ‘ban upon the personal’ poetical philosophy. In following this philosophy, Gibb’s book is both interesting, in an old-fashioned way, and frustrating, if you think you are going to get to know anything of the poet himself. Who softly closes the door. This image can be seen as both a common everyday occurrence, and as suggestive of a specific clandestine meeting, while the poem as a whole is a ‘birth to death’ résumé of mortality. However, the majority of the poems in The Thin Boy & Other Poems are what you might call ‘intellectual’, and the characters are often representative rather than actual. They often fall into the ‘You,’ ‘He,’ or ‘They’, or into emblematic characters such as The Plain Clothes Policeman, The Man in the Ivory Spire, An Old Woman, The Writer, The Painter, et al. Also, Gibb’s stylistic writing emerges as ‘faux formal’, mainly staying within strict – if at times uneven – stanza structures, which are mostly in the blank verse of the Modernist poets. The one time he deviates is in a poem called ‘Like Pencils, Like Diamonds, Like Knives’, which may be described as a ‘pre-concrete poem’, in the manner of Apollinaire and the Dadaists and Surrealists of the early twentieth century, where the words are laid out in such a way as to resemble or echo the subject of the poem. In this work Gibb very cleverly brings the poem towards and away from a central point, with the eight lines of varying length on either side of the central ninth line making a shape resembling a pencil, a diamond and a knife. I hope now that John Gibb has finally made his magic trick – that is, his poetry brought forth out of the hat with a flourish – he will display for us more of his ‘dreams’, rather than his poetic persona’s anxious ‘nightmares’. I am sure that he has a lot more tricks up his sleeve to show us. Let the wait not be as long. 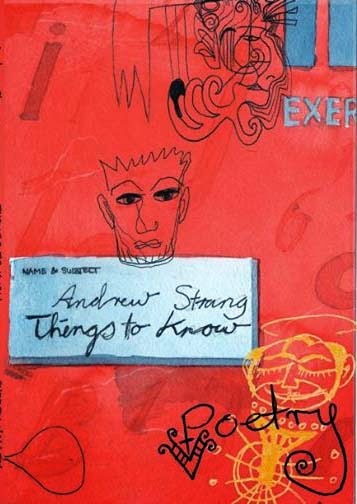 Andrew Strang is a poet whose work is almost the exact opposite to the writing of John Gibb. Another Otago poet, Strang wrote highly personalised, self-revelatory poems. He was a presence in the Dunedin arts and music scene through the 1980s and 90s, and he used to frequent a bookshop in the Octagon called O’Books, which was run by artist Bryan Harold and me. This bookshop, along with our art gallery O’oopps (reached via a partly concealed staircase beneath the shop), was a centre for Dunedin’s bohemian fraternity in the early 1990s. Strang was part of the Chippendale House and Super 8 art-and-performance collectives, and continued to be an integral and innovative member of the Dunedin arts and music movement until his sudden death in 2000. Things to Know is both sad and as full of life as was the character of the poet himself. His life is expressed here in all of its exuberance, its beauty and its pain. The poems are written in long, fragmented stanzas, which often establish a metaphor for the way he is feeling. Finally, it is to the dedication and love of his family that we owe this publication, and also to academic and fellow writer John Dolan, whose insightful introduction recognises Andrew’s talent as a poet, and who acknowledges that while Monsieur Grim Reaper will finally catch up with us all, ‘few of us will leave behind so noble and proud a testament’ as Andrew. Camel has two humps. It’s an action song. That Alice, she laughs in the face of adversity, she laughs at danger, she laughs at life’s tragedies, large and small. Alice the Comedienne. Alice has never wanted children but now here she is, producing all these babies, suddenly, every week a new one, filling her house. She wonders where she’s going to put them all, soft and hairless as they are, and needing her. They just keep slipping out of her, in her sleep. Freegard’s book is dedicated ‘To everyone who was there’. 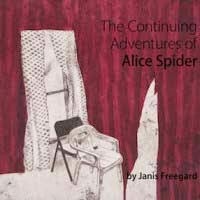 However, the New Zealand band The Fourmyula’s joyous and trippy 1968 song ‘Alice is There’ is perhaps more in tune with Alice herself, because this wonderland of a little charming book attests to the fact that the ebullient Alice the Spider IS certainly THERE. London-born Cliff Fell is a poet, essayist, musician and book reviewer who settled in New Zealand in 1998. He has worked variously as an archaeologist, filmmaker, bank-clerk, truck-driver, bartender and roadie. His poetry has been published widely both here and overseas, and his ‘Motueka Song’, a radio-poem about the Motueka River, was broadcast on National Radio. Fell won the 2003 Victoria University Adam Prize, and his first collection, The Adulterer’s Bible, was named Best First Book of Poetry in the 2004 Montana New Zealand Book Awards. Unlike John Gibb’s marathon, Fell’s book was a mere twelve years in the making and is seen by the poet as the ‘missing piece’ of his first book. Late in the night he sends his coded message. I want to confess to how I fell in love with love and I want to make a case for adultery, but I can’t make a case for adultery, I can only make a case for love. Between the sheets, as it were, of paper that make up his book the poet writes what is referred to as an acrostic poem, in which the first letter, syllable or word of each line, paragraph or other recurring feature in the text spells out a word or message. 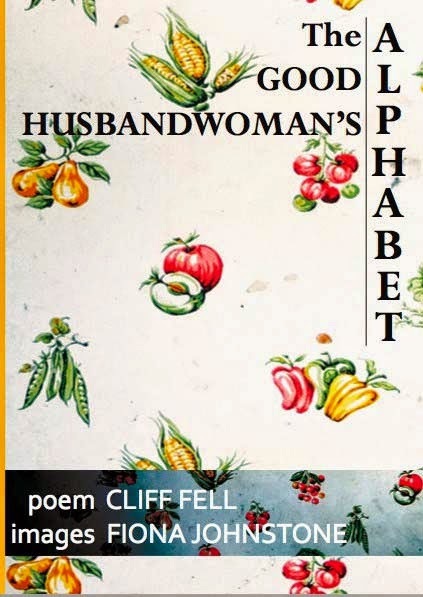 It is also a type of puzzle – and I will leave it up to the reader of The Good Husbandwoman’s Alphabet to find their own answers to Fell’s intriguing word-game. Suffice to say that the two quotes above provide a clue and the poems are, by themselves, interesting enough – even for those who don’t like word-games. There is one poem of six-line stanzas for each letter of the alphabet, each stanza beginning with a word that represents a letter of the alphabet. For example, the first stanza begins with the word ‘Animals’ while the last begins with ‘Zero’. The alphabet becomes a metaphor for life itself, beginning with ‘A’ through to ‘Z’; there is only one way to go after that: back to ‘A’. Thus the cycle of life, love and death are repeated with each generation. The Good Husbandwoman’s Alphabet is beautifully illustrated, with wallpaper images by Fiona Johnstone and photographs by Ivan Rogers adding a visual domestic surrealist picture-puzzle to enhance the words. MICHAEL O’LEARY is reviewer, novelist, poet, playwright, small-press publisher and second-hand bookshop proprietor who lives in Paekakariki, on the Kapiti Coast. His many publications include a comic novel trilogy about trains, The Dreamlander Express, comprised of Unlevel Crossings (2002), Straight (1985), and Magic Alex’s Revenge (2009). And ‘the blank verse of the Modernist poets’ is, presumably, that of Stevens in, say, Sunday Morning? There aren’t many other candidates, apart from Four Quartets Eliot, for Modernist poets who wrote blank verse, none of which Mr Gibb’s prosody at all resembles.